Art Harwood. Photo credit Mitzi Rider. Fort Bragg, CA Forty supporters joined the Redwood Forest Foundation (RFFI) in the Usal Redwood Forest’s Founders Grove as RFFI Board Chair, Kathy Moxon, dedicated an old-growth redwood tree to Art Harwood, honoring him as a RFFI Founder. RFFI reserves the term ‘Founder’ and the dedication an old growth redwood to those very few individuals and organizations that have played an absolutely crucial and fundamental role in helping the foundation achieve its important mission. Art was named a Redwood Forest Foundation Founder in July 2015 at RFFI’s Annual Meeting attended by 125 supporters. In October 2016, forty RFFI supporters and long-time admirers of Art and his contribution to RFFI and the region traveled deep into the Usal Forest to the remote Founders Grove to dedicate this old-growth redwood (pictured here) to honor Art. In addition to the RFFI Board, staff and volunteers, two other RFFI Founders, Don Kemp and Henry Gundling were present. Art Harwood is a Founder in every sense of the word, having played a seminal role in the creation of the Redwood Forest Foundation and guiding it through crucial developmental phases. 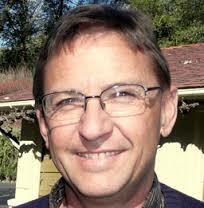 He served as Board President when RFFI purchased the 50,000-acre Usal Redwood Forest in 2007. He took over the reins as Executive Director in 2008 and molded RFFI’s organizational structure. He now serves as a Community Advisor. 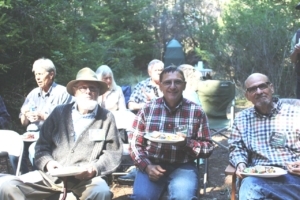 Art Harwood pictured here on October 9, 2016 with two other Redwood Forest Foundation Founders, Henry Gundling and Don Kemp. photo credit Mitzi Rider. Mark Welther, RFFI’s President and CEO, commented, “Art was there at RFFI’s beginning, guided us through our formative years, and still advises us today. He’s a steady voice making sure we connect with our roots and our community.” Harwood was the Executive Director when RFFI completed the complex conservation transaction valued at 25.5 million dollars that protected Usal, an area almost twice the size of the city of San Francisco. The transaction created the largest working forest easement in California and assures that the 50,000 acre Usal Redwood Forest will remain, in perpetuity, a working forest for the economic and environmental benefit of our communities. Further, his legacy includes permanently protecting 1,000 acres of Usal Forest’s remote coastline and forest with its 11 acres of old-growth redwoods, permanently preserving the coastal area, assuring public access and opening up a gateway to thousands of acres of coastal lands, trails and beaches. Despite the enormity of these accomplishments, Art may be most revered for his deep commitment to the community and its role in managing its forests. He took the lead in helping the community resolve the bitter resentment and conflict that rocked the region during the “Timber Wars” of the ‘90s. His leadership and adept conflict resolution skills united the warring factions and established the basis for the impressive accomplishments that were to follow. It is with great pride that RFFI honored Art Harwood as a Redwood Forest Foundation Founder.